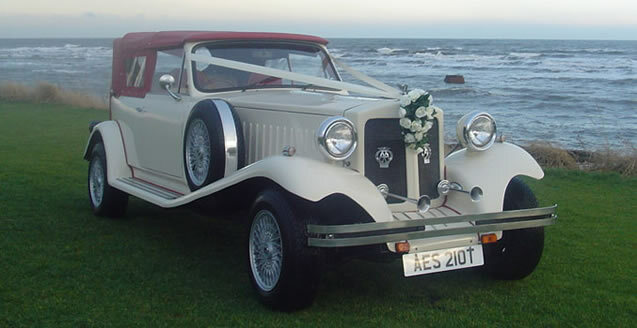 Mann's Limousines is one of the leading suppliers of traditional wedding car hire, We are able to supply you with a choice of classic car hire options. 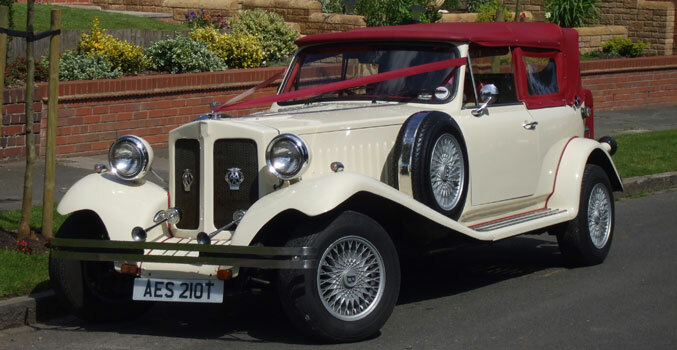 Here is our beautiful hooded Ivory Beauford Tourer which cant fail to impress when your church wedding demands style and refinery. Please fill in our simple online quotation form at the bottom of this page and we will get back to you as soon as possible with your price and requirements, alternatively you can call Freephone 0800 511 8 511 or 0121 525 1559 and speak to one of our sales team who will help you with your enquiry. This 1930's style tourer has been beautifully prepared in ivory with red hood. It looks superb with the hood down! This car is great for some one who requires a car to contest or compliment her colour scheme.